With Mountain Lion, Apple continues to make OS X iOS more similar in look feel, and even nomenclature. So OS X’s Address Book app is now Contacts, and iCal is now Calendar. More notably, there are some new Mac apps built specially to match and sync with iOS counterparts. The new Reminders app looks more or less identical to the iOS version, and it provides the same the same basic to-do list functionality as its iOS counterpart. You can, for example, set location-based reminders on your Mac that will trigger alerts on your iPhone when you enter or exit a given place. Reminders won’t replace hard-core task-management apps, but it’s fine for people who want a basic set of checklists synced across all their devices. Game center: It’s nice to see what your friends are playing. But it’s even for Mac game developers, who can take advantage of buddy lists, rankings, and other features. The Notes app will also be familiar to iPhone and iPad users. It’s far more than a replacement for Stickier (which is still there in the Applications folder). Notes supports rich texts, with hyperlinks, various fonts, bulleted lists, images, and even file attachments. It also syncs with the Notes apps on iOS (though, oddly, it doesn’t use iCloud to do so). It works well enough that I’ve started using Notes on my iPhone. There’s also a new Game Center app, which finally ports Apple’s buddy system for games from iOS. Yes, you can log in, add buddies, and see what games your friends are playing from the app. But the app isn’t as important as the fact that Game Center is now available to Mac game developers get access to buddy lists, a ranking system, in-app voice chat, head-to-head gameplay, and gameplay across Apple platforms. Expect a flood of Mac games that are versions of games previously seen on iOS. In 2011, Apple introduced iMessage, a messaging system that lets iOS devices communicate directly with one another. (The actual app on the iPhone is called Messages). Unlike SMS text messaging iMessage transfers data via the Internet, so users incur no text charges. 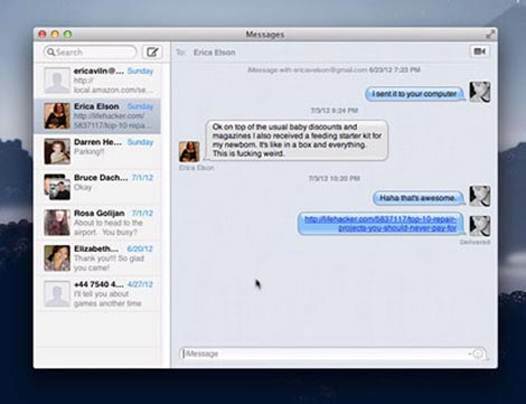 Mountain Lion adds support for iMessage in the form of the new Messages app. Like Messages on the iPhone, Messages for the Mac lets you hold chats with several participants at once. Like the iOS version, it can let people know when you’ve read their messages and when you’re tying a reply. An integrated video-chat button allows you to hold video chats over traditional instant-messaging systems (as iChat has always done) or by launching FaceTime. It’s nice to have access to iMessage from my Mac. Before, when I’d receive a message on my iPhone while working on my Mac, I’d be frustrated that I had to type out a response on my iPhone keyboard instead of the full keyboard I was already using. It’s now easy to send a quick message to my wife when I’m at work – all I have to do is type her name in a new Messages window, and then type a message. This isn’t to say there aren’t frustrating things about Messages. Sure, it’s great that using iMessage means you have a record of your conversations on all of your devices, and it makes it easy to continue a conversation even if you have to shut down your Mac and head for the bus stop. But every time I receive a message via iMessage on my Mac, my iPad and iPhone also chime or vibrate. These should be a way for Apple to detect which device I’m actively using and to direct iMessage conversations (and alerts) there. Messages has another odd side effect: When I opened my Mac up after I had been having an iMessage conversation on my iPhone, Messages launched and opened a new chat window displaying the old messages from that conversation. It’s nice to have a transcript of that chat on my Mac, but it’s an inelegant way to do it. I also found that sometimes, when I’d logged out of all my services, I couldn’t log back in until I deactivated and then reactivated the account. The bottom line is that I love the idea of iMessage, but Apple needs to make the cross-device experience a little less obtrusive. 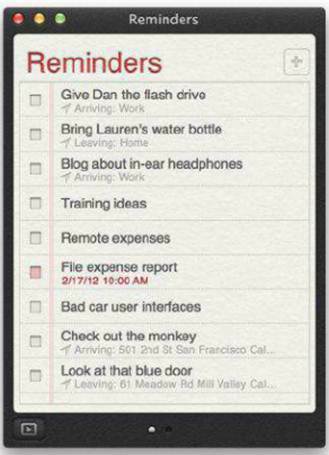 Basic task management: Reminders won’t put OmmiFocus out of business, but it’s fine for maintaining basic to-do lists. For years, Mac app developers built their own alert systems – think of those reminder pop-ups in iCal, for example. With Mountain Lion, OS X gains a systemwide notification feature that’s available to every developer. Notifications appear in the top right corner of the screen in a small buddle. There are two kinds: Banners remain there for five seconds and then slide off the screen (unless you swipe them away first or click them to open hand, remain on screen until you click the Show or Close (or, in some cases, Snooze) button. You can see all of your notifications in the Notification Center, a narrow list that lives just to the right side of your screen. You can reveal it either by clicking on the Notification Center icon at the far right of the menu bar, or by swiping with two fingers staring at the far right edge of the trackpad. Not all notifications come from apps: Because Mountain Lion integrates support for Twitter and (coming this fall Facebook, Notification Center can display notifications from both services – including direct messages and/ or mentions on Twitter, and a whole host of optional items (events, application and friend requests, comments, wall post, messages, and so on) on Facebook. Messages: The big difference between iChat and Messages is the latter’s support for iMessage, but it still support AIM and Jabber. You control the kinds of alerts you see and the form they take in a new Notifications pane in System Preferences – analogous to the Notifications submenu in iOS’s Settings app. You can also squelch notifications when they’re not appropriate: if you scroll up in the Notification Center list, you see s Show Alerts And Banners option. Flip the switch to Off, and it mutes notifications (but only until tomorrow). Notifications Center also automatically sense when you Mac is connected to an external display. If the OS detects that the Mac is hooked up to a TV or projector, it won’t show any notifications. Notification Center is the sort of feature that needed to be part of the operating system for the sake of consistency, and Apple has done a good job of implementing it. I appreciate being alerted when someone sends me a direct message (DM) on Twitter or when I’ve received an important email, and the settings in the Notification Center control panel are granular enough to allow me to suppress any notifications that get in my way. I appreciate being alerted when someone DMs me on Twitter or when I receive an important email.